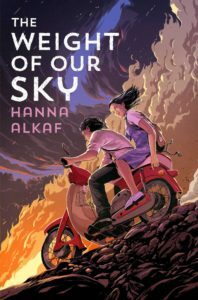 If you’ve read the posts from last week, you will see my rave review of The Weight of Our Sky and so it should come as no surprise that I was able to interview Hanna! I am so pleased and so happy to be shining light on more authors! Find The Weight of Our Sky on Goodreads, Amazon, Indiebound & The Book Depository. In your letter to the reader, you talk about the importance of stories to keep memories alive. For those who haven’t read your brilliant letter to the reader before the book, where you discuss the trigger warnings and how special this book is to you, can you talk about the motivation you had for writing this book? I wrote this book because it was a story I had had percolating in my head for a really long time, and it wouldn’t leave me alone. I wrote it because I wanted the May 13th incidents to be remembered, and not allowed to fade away into nothing more than a few lines of sterile facts in a history textbook. I wrote it to honour the memories of survivors, and so that readers would bear witness to our scars. Music is incredibly important to Melati in The Weight of Our Sky, what were your musical influences growing up and what are you currently listening to now? I grew up with the music of P Ramlee, the Carpenters, the Bee Gees and Cliff Richard, among others, thanks to my parents. From my sister, I got a love of classic rock — Queen, Aerosmith, Led Zeppelin, Jimi Hendrix, the Beatles. As a tween, I was a HUGE Backstreet Boys fan — like, sticky lip gloss kisses on posters huge. And then later, throughout college and beyond, I listened mostly to pop punk and ska…and my playlist hasn’t changed since, haha. Melati’s OCD is incredibly important in the book, and in your letter to the reader, can you talk more about what it was like to write Melati’s character? There is so much of me in Melati that writing her character was both freeing and incredibly scary, as always happens when you basically bleed on the page. But it was very important to me to explore that intersection of religion and mental illness, because for many of us here in Malaysia, where faith plays a big part in our lives whether willingly or not, this is the space we occupy every day. Being a YA author and living in Malaysia, can you shed light on some challenges you have because you aren’t living in the UK or the US? I’m not sure many readers are aware of any differences you’ve come across while querying or even promoting your book when you are abroad. I didn’t feel the distance so much when I was querying, because that’s a process that largely happens online for everyone anyway, although when it came to talking to agents, there were a lot of Skype calls at odd hours to accommodate the time difference! Now that my book is about to be released, however, is when I’m really feeling how far away I am. I can’t do the kinds of events my fellow authors are able to do, can’t attend the industry’s biggest conferences, can’t be on the right panels or meet the right people in person. Chats that happen at 8pm for everyone else happen after I’ve hurriedly gotten my kids ready for preschool and hustled them out of the door. Twitter discourse that’s starting to die down just as I wake up — although I’m grateful for that, because I rarely want to get that worked up early in the morning! It’s hard not to shake the feeling that I’m missing out, that my book will lost in the shuffle. Lili here, that is one of the biggest things I’ve noticed about the time zones is that I have a similar experience to Hanna. When I wake up I can either wake up to something great, or an absolute garbage fire. 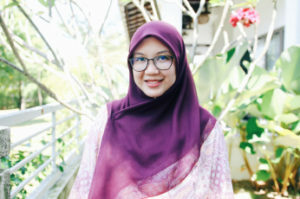 Bringing historical fiction and Malay folklore to your writing is a common thread throughout your books, can you talk about the ways in which you think these stories will resonate with Malaysian teens and also readers from other cultures? As your stories keep traditions and memories alive, do you pick certain topics that you believe need more attention or that are particularly meaningful? My hope is that the stories will resonate no matter where you’re from because while the stage and the cast of characters may be new to some, the feelings and relationships and traumas and joys are universal. I think anyone can relate to the way your heart beats a little faster when a cute boy holds your hand, or the gutting realisation that your parents don’t always have all the answers. Can you talk about upcoming projects? I saw your Twitter poll with 80s Malaysia-Set MG, Serjarah Melayu YA fantasy, and 16th Cent YA in verse, and they all sound stunning. Have you always wanted to write a book in verse? I’m always working on roughly half a dozen things at once! I don’t want to say too much about each individual project; what I will say is that they’re all very Malaysian in their own way, each exploring different parts of our history and different facets of our folklore and our culture. I love verse but I’ve never actually written anything like this for public consumption, so who knows if it’s even any good?? What books have you been loving recently that you would like to recommend? Creatures of Near Kingdoms, written by Zedeck Siew and illustrated by Sharon Chin, is a lovely encyclopedia of fantastical flora and fauna; Zedeck’s writing is lush and lovely, but it’s Sharon’s linocuts and patterns of these strange, whimsical creatures that really elevate this to something incredibly special and unique. It’s published locally, but they ship worldwide; PLEASE GET IT! Also to the surprise of no-one, Sadie by Courtney Summers is dark and unsettling and worms its way under your skin in a way that has you thinking about it for weeks afterwards. Lili here, a great book recommendation that I am definitely adding to my list! My name is Hanna Alkaf. I’m a storyteller, a doodler, and a full-time wrangler of two tiny humans.I wrote my first work of fiction, a short story that was selected for publication in a local anthology, at age 18. Afterwards, when I tried again, it seemed the well had dried up. I would start, then stop, start, then stop. Clearly, I thought, I was meant to make my living writing nonfiction. The communications manager at Teach For Malaysia. Even my first book was a work of creative nonfiction, a way of parlaying my years of experience into an even longer form. Then at 30, I thought: What exactly IS stopping me from writing fiction? That year, I penned The Tryouts, which went on to win the inaugural DK Dutt Award for Literary Excellence, and which appears in the companion anthology Champion Fellas. At the end of 2016, I started a young adult novel, the very first one I’d ever attempted. By 2017, I had a literary agent and a book deal. And in 2019, you’ll be able to buy that book, THE WEIGHT OF OUR SKY, in bookstores all around the world. Which is to say, you may not be the writer you thought you’d be, or even the one you want to be right now. But time has a funny way of allowing us to excavate and extricate our true selves, if we let it. Who are your favorite international authors? Love love love this author interview, Lili! Loved reading Hanna’s responses and I enjoyed your questions as well!